If you are a snow lover and hoping to see some more Valley snow, I have some good news and some bad news. It’s been feeling very springlike lately with highs in the mid 50s. Now that’s warm for January standards; but enough of that, if one thing is certain, it’s that much colder air is moving in. Rain will get going late tonight and through much of Wednesday. As the rain moves through a potent cold front also moves through. But as every north-westerner knows, how much moisture is available as the coldest air moves-in? So here’s the good news: any precipitation that falls overnight on Wednesday and into Thursday should be in the form of snow. This means that all of us have a chance to see snow flying. The bad news: it appears as though the brunt of the precipitation is in the form of rain when temperatures are too warm, so sticking snows are unlikely along the Valley floor. Here is the latest 72 hour forecast from our in house RPM model. 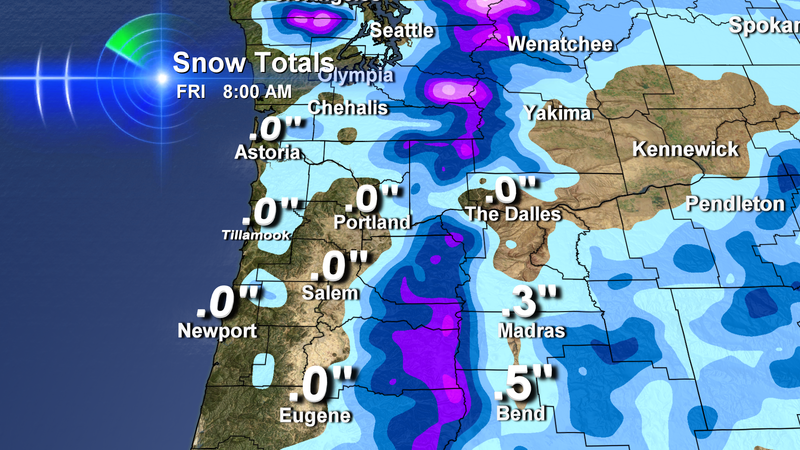 So it doesn’t look too promising for Valley snow to accumulate. But keep in mind, if any moisture hangs on for a longer period of time and the cold air (which can be pulled down quickly by intense precipitation rates) sets in, we may have to adjust our forecasts. Right now I’d say anyone, even along the Valley floor, could see at least a dusting. Next Post Snow, Snizzle, What Is it Falling From The Sky Today?